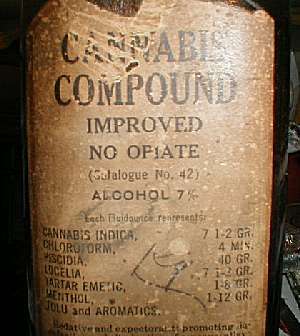 Here we have a very unusual IMPROVED CANNABIS COUGH SYRUP REMEDY from THE WILLIAM S. MERRELL COMPANY of CINCINNATI, OHIO. This outstanding, corked amber bottle is 7.75" tall. The contents have evaporated over the past 100 years. This bottle is from MORWESSEL'S DRUG STORE, which was located in COVINGTON, KENTUCKY.